So you’re in the market for a beginner guitar. It might be for a child, loved one or friend, or you might be considering learning yourself. It’s fairly common knowledge that you can easily purchase a cheap instrument from a number of online retailers, which may well be your first thought. Second hand & classified ad sites like eBay, Gumtree and Craigslist offer an ever-changing selection of items. Unwanted gifts, used and abused – you never really know what you’re buying into. Then there’s big online retailers like Amazon, Argos (UK), Walmart (USA) and Aldi (EU), famed for selling an even cross-section of just about anything you can imagine. While the prices are attractive and the purchase process is straightforward, you still don’t really know what you’re going to get. So what’s the answer? N.B. while we’ve written this article based on guitar, the same points could apply to any instrument. This includes bass guitars, acoustic guitars, digital pianos, drums & percussion instruments, and much more! As we said, you can buy a guitar pretty much anywhere nowadays. But what about a guitar that you actually like? Buying your first guitar is an incredibly important step in your musical journey (to state the obvious), so you want to make it count. When you buy from a music shop, you’re presented with a huge amount of choice that’s tailored specifically for musicians. You can get a better idea of what you like the look of, what suits your style or playing ability – and if you’re able to actually pay a visit to a music shop, you can actually feel & listen to the guitar too! This will help you make a more informed choice that’s right for you. There’s nothing quite like being able to reach out and touch your instrument before you buy! 2. They Don’t Stock Rubbish! Further to our point about choice, you not only have more to choose from – the quality is higher. Music shops are not going to stock cheap guitars because they’re cheap. Their guitars and instruments will simply have to be of a certain quality to be in stock in the first place. This simply means that you can’t go wrong when looking for the best beginner guitar. Rather than buy into unknown brands or copies, you’re getting the real deal. Reputable music shops stock some of the best brands in the business, including Squier, Yamaha, Ibanez, Epiphone and many more. These brands go well beyond entry level instruments, so you know that you can trust them! We all love a bargain. And while you save a fair few pennies when buying from larger retailers, you get what you pay for. Spend the same amount, or perhaps a little extra, in a music shop, and you won’t regret it. 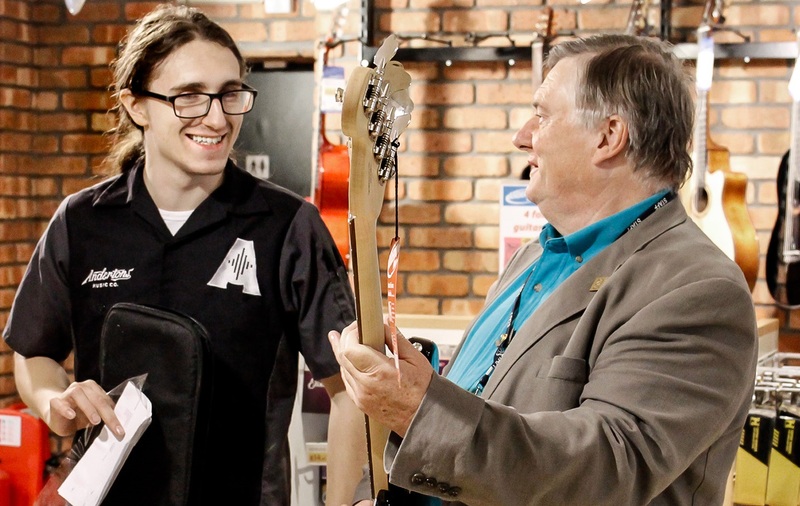 Expert sales advice, more choice – buying from a music shop isn’t just easy, it’s supposed to be a fun experience too! And as we mentioned earlier, whatever you do spend will be spent wisely; you’re only buying trusted gear recommended by other musicians. You can’t go wrong with that, right? Buying from a music shop is a personal, enjoyable experience that you’ll remember. Your custom is valued; because of this, you’ll always be looked after. Whether you pay a visit to the shop itself or shop with them online, both you and your instrument are taken care of at every step. You can ask for personal advice and recommendations and have the opportunity to try instruments out. And let’s say you decide to purchase – it doesn’t end there. Your instrument will be sold to you in tested and working condition, whether it’s a guitar or an electric drum kit. You can be sure that you won’t be disappointed, with advice on setting it up, recommended accessories to consider – they might even teach you a few guitar chords while you’re there. Even afterwards, you’ll feel comfortable knowing that you can simply pop in or call with any questions you may have. How do I re-string my guitar? How do I connect my keyboard to my computer? Most reputable music retailers have friendly teams on-hand to deal with any enquiries – easy peasy. For many musicians, beginner or veteran, learning an instrument is more than just a hobby. It sounds cliché, but it’s a way of life. When you decide to pick up a new instrument, you become part of a community; and when you buy from a music company, you get a warm welcome. It sounds soppy, but as a family-run business for over 50 years, it’s how we do things at Andertons Music Co. This means everything from tips on tuition and finding guitar, piano and drum lessons, to an insight into what’s to come. Local events, big releases, music news, helpful guides and articles (much like this one, we hope!) and more. You’re part of the family now! Are Second-Hand Instruments Good for Beginners? Some people consider second-hand instruments to be viable choices for beginners. The main draw is the price, where the likelihood of grabbing a bargain is high with sites such as Ebay and Gumtree so popular these days. However, although finding a gem is possible, most of the time second-hand starter instruments will be duds. Whether they’ve been left banished in damp closets for years, or simply mistreated by rebellious teenagers, there’s always an element of risk when it comes to buying second-hand gear – especially more affordable instruments. As most beginner instruments are constructed from cheaper materials to keep their costs low, they can be more susceptible to wear and tear. Of course, we’re not saying that you should avoid second-hand musical equipment at all costs, as in fact we have our very own dedicated second-hand section featuring some amazing gear. However, with cheaper instruments we’d always recommend trying them out before buying! If you enjoyed reading this piece, you might want to check out the rest of our learn articles here. And if you want to know more about buying for beginners, head over to our site to see what’s on offer!